Former Somerset batsman Alviro Petersen made 83 on his return to Somerset as Lancashire made the most of a typically batsman-friendly Taunton track. 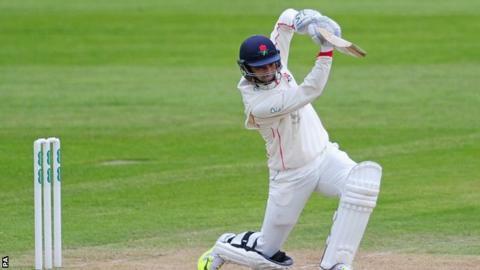 Sharing a fourth-wicket partnership stand of 125 with Lancashire skipper Steven Croft, who remains unbeaten on 71, Petersen top scored on 83 to help his side finish the first day on 295-4. After losing the toss, there was little morning movement for the seamers. But Somerset left-arm spinner Jack Leach came on to claim two wickets. His first scalp was Haseeb Hameed, who drove at a full ball to be well caught by Tom Abell, one of the two short extra cover fielders positioned for that very shot. He then struck again just after lunch to trap Lancashire opener Karl Brown for 47, beating his forward defensive push. Luke Procter enjoyed a life when dropped at second slip on 16 by Marcus Trescothick off Jamie Overton, but was unable to profit, falling leg before for 26 to a good-length ball from Tim Groenewald. Overton then ended Petersen's innings with the second new ball, when he too was given out lbw, aiming an aggressive shot across the line. But Alex Davies came in to make an unbeaten 32 in a stand with Croft, which has so far put on 45. "It's a very good pitch. The ball came onto the bat and there was some spin, which could be good for us later in the game. "Somerset bowled well. They tried to keep things tight. We have talked about the importance of big partnerships and it was an important one between myself and Steven Croft. "Having lost Ashwell Prince and Paul Horton, I feel there is more responsibility on my shoulders. I don't try to be a hero, but I do try to get the best out of myself every innings. "It was a tough day for us, but we did pretty well because the pitch wasn't helping us much. "It was great for me to bowl a long spell so early in the season, particularly following the back problem I picked up in Perth during the winter. I got through without feeling it, which was great. "It didn't feel like a spinner's conditions because it was pretty cold, but the pitch was dry and I was pleased with the way I bowled."